Ukraine will begin the withdrawal of military equipment and small-caliber weapons from the demarcation line in the Donbas conflict zone in the afternoon on Saturday, presidential administration spokesman for the Anti-Terrorist Operation Colonel Andriy Lysenko said at a briefing in Kyiv on Saturday, according to an UNIAN correspondent. "In the afternoon on Saturday, we will begin the movement of military equipment at certain sites. 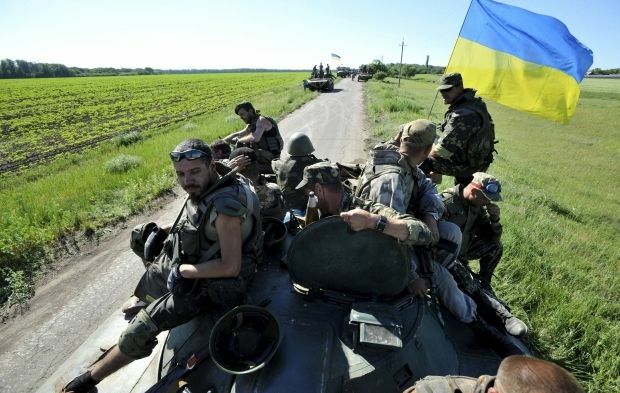 We are waiting for the same actions by the militants, who have already announced that one of their tank columns was sent, but no one knows where and at what sites, as the OSCE representatives were not informed about this and they were not invited," Lysenko said. "It is the first stage of withdrawal of weapons and military equipment, including tanks, at a distance of 15 km," he said. According to Lysenko, all organization work was carried out on Saturday morning. In particular, the Ukrainian side made lists of equipment and weapons with records of their technical rooms, identified routes and storage sites, and informed the OSCE representatives. As UNIAN reported earlier, French President Francois Hollande announced that the Normandy Four talks in Paris on Friday had agreed that light weapons would be withdrawn from the contact line in Donbas "with the start of tomorrow," and a similar process would begin on heavy weapons.